A user must have the Topic permissions enable to perform any of the operations in this document. This document will review how to add, edit, and delete topic entries in your KB site. It will also provide an overview of the settings available for individual topics. Click on the Topics tab in KB Admin Tools. Determine the level you would like to add a new topic to. (Level 5 is the parent of Level 4; Level 4 is the parent of Level 3, etc.) Click on the Level [#] Topics link on the left for the desired level. Parent topic: This field defaults to very first parent topic. Use the drop down to select the appropriate parent topic, or leave the defaulted selection of "Undefined" if the new topic should not exist in a hierarchical structure. Topic name: The name of the topic, as it will appear in the topics tree, topics dropdown, and sitemap. Topic description: An optional topic description. For level 1-4 topics, this description is only displayed on this page. For level 5 topics, the description will also appear as a site footer on associated documents. DocID: When you create a Topic meta-description document, you can place the Document ID number in this field. Order: An optional field that allows you to manually set the order of your topics. All new topics default to "0", and if unused, topics will be ordered alphabetically. Admin group: If you have defined User Access Groups for your subsite, you can use them to provision publish rights to group members for documents associated with the topic, without having to grant them full publish rights for all documents. Contact email: An optional field that allows you to enter an email address for use in feedback routing. This will only take effect if Send user feedback to topic-based contact email address(s) is checked under SitePref > Notifications > Document Feedback. Activation notification email: An optional field that allows you to enter an email address to be notified when a user updates a document assigned to that specific topic. Active: Defines whether the topic is in use. If unchecked, topic cannot be assigned to documents and will only be visible on this page. Internal: Defines whether the topic appears on the internal sitemap. External: Defines whether the topic appears on the external sitemap. Admin Only: Defines whether the topics can be modified by all users (unchecked) or be modified only by KB Admins. Reminder: Defines whether review reminders are sent out for documents associated with the topic. This option is checked by default and should only be unchecked for topics assigned to documents that, based on the nature of their content, would never require review (e.g. meeting minutes). Public Share : Defines whether associated documents are flagged as publicly consumable. If checked, other KB group subsites do not need to request permission to publish an associated document to their internal site (via the "Use Docs from..." tool on the Documents tab). It is not possible to publish another group's content to an external site without it being explicitly shared. Look at the Topics Tree and take note of which level you would like to edit a topic in. (Level 5 is the parent of Level 4; Level 4 is the parent of Level 3, etc.) Click on the Level # Topics link on the left for the desired level. You may also click the names of the topics in the Topics Tree. Make desired changes in the text fields for that topic. Click Update button for that topic. You can edit multiple topics within the same level and click Update to save them all at once. Click on the Change Levels link on the left navigation bar. The topics displayed are the topics that are not associated with a parent or child topic. Change the topic level by choosing the appropriate level in the drop down menu on the right. Click on the Update button to complete the topic level change. 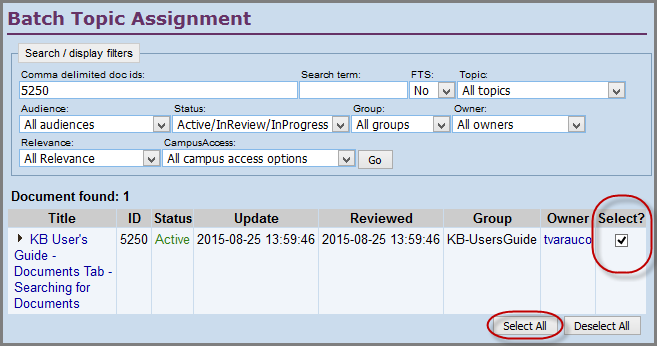 Begin by opening the Topics tab and clicking on the Batch Topic Assignment link found on the left navigation bar. 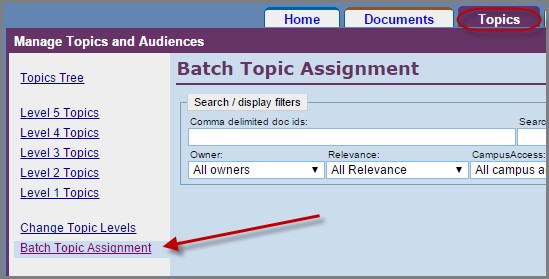 The Batch Topic Assignment screen will appear. To refine your search, use any/all filters below. Comma delimited doc ids - A document ID number or query string may be entered here. If a document ID is entered all other filters are ignored and that document is opened for review. If a query string is entered results from a keyword search will be returned for all documents whose title or keywords contain the query string entered. Case is ignored. All other filters will be used in a query string search. Click the Go button on the far right hand side to execute the search. Search Term - Enter keywords here. Results from a keyword search will be returned for all documents whose title or keywords contain the query string entered. Case is ignored. FTS - (Full Text Search ). This field defaults to No, or you may choose Yes from the dropdown menu. Topic - Lists documents in the specified topic. Options to select All topics or No topics assignment are available in the drop down in addition to all topics set up in that KB group (must have drop down check box selected in Topics tab). The example below shows the topics in the KB User's Guide KB. The All topics selection is defaulted at the top of the list and the No topic assignment selection is defaulted at the bottom of the list. Audience - This field defaults to All Audiences. If you have enabled Audience types or have created custom Audience types, they will appear in this dropdown list. Status - Use this drop down to limit results to documents of a specific Status. This field defaults to Active/In Review/In Progress. Choices are: Active, In Review, In Progress, Active/In Review, Active/In Progress, Inactive and Trash. Group - Use this drop down to limit results to documents of a specific Group. Choices are: My group, Other groups, All groups. Select Other groups to see all documents being shared in to your group. Owner - Use this drop down to limit results to documents of a specific KB author or author/admin. Names are listed last name/ first name. By default All owners will be selected. Relevance - This setting defaults to All Relevance. View documents by relevance such as My/sharing groups, My Campus, My University System and Universal. CampusAccess - This setting defaults to All campus access options. Use this drop down filter to limit results to documents of specific a Site Access restriction(s) based on the presence/absence of a valid campus login. Choices are: Defer to SiteAccess, Ext/internal with campus login, Internal for all campus users. . Select a topic from the Active topic dropdown menu and either choose Add topic assignment button or the Remove topic assignment button. Please remember that when applying either topic assignment, documents already associated with the selected topic will not be affected. Look at the Topics Tree and take note of which level you would like to delete a topic from. (Level 5 is the parent of Level 4; Level 4 is the parent of Level 3, etc.) Click on the Level # Topics link on the left for the desired level. You may also click the names of the topics in the Topics Tree. Click the Delete link for that topic and click OK at the pop up message. Then click the Update button. You can only delete one topic at a time. Each topic has its own Delete link.